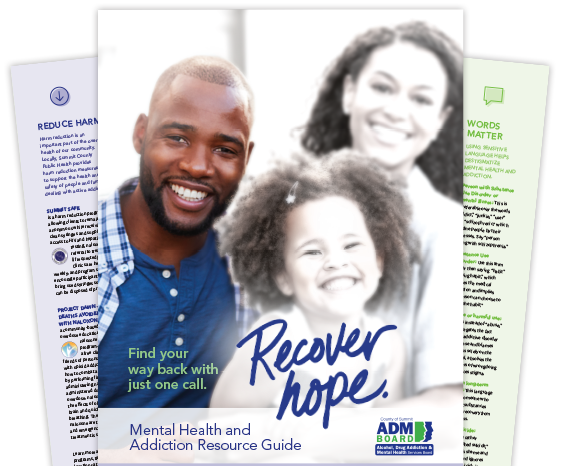 The ADM Addiction Helpline is a service to assist individuals who are looking to recover from an addiction to alcohol, drugs or gambling. Callers will be asked a few questions: treatment preferences, insurance coverage, location, etc., to assist the Helpline staff in determining which local treatment providers could meet their needs. The caller will be provided with information about treatment options available to them based on their individual circumstances. Once the caller knows their options, they can choose the local agency where they would like to begin treatment. The Addiction Helpline staff will then connect the caller to the selected treatment agency to make a warm hand-off and to schedule the initial appointment. Find out more about local treatment resources for Adults and for Children and Teens. Medication assisted treatment (MAT) uses medications such as Naltrexone (Vivitrol), Methadone, and Buprenorphine (Suboxone) in combination with counseling to treat opiate addictions. These medicines help to curb the side effects of withdrawal so that the patient can engage in behavioral therapy and begin the recovery process. The medication eases the physical discomfort and may also decrease the cravings to use opiates. Used in conjunction with a prescribed level of therapy, individuals develop the tools to better equip them to face the challenges of recovery and enjoy the benefits and rewards of sobriety. Medication assisted treatment is evidence-based and supported by the Substance Abuse and Mental Health Services Administration (SAMHSA). Call 330-940-1133 to get started. These certified programs are designed to address addiction-related offenses by helping get people into treatment through a court-supervised program. These programs not only support treatment, but enhance public safety, reduce crime, hold offenders accountable, reduce cost to the community, and provide an opportunity for offenders to transform into positive, contributing community members. Turning Point - Common Pleas Court – Promotes treatment in lieu of conviction. Participants are court monitored for up to one year. Participants must remain compliant to treatment recommendations and other court ordered mandates such as probation and community service. The program brochure is available here. Crossroads - Serves minors with substance abuse/dependence problems and mental illness and provides intensive probation lasting a minimum of one year with regular court appearances. The program also works with parents and youth to strengthen and improve the family unit. Download the Crossroads Program brochure. Recovery Court – Akron Municipal Court -Through Recovery Court, less-serious, drug abuse offenders have the opportunity to have their charges dismissed once they successfully meet all the requirements of the year-long program, including treatment, aftercare, sobriety, case management and drug free status. Family Reunification through Recovery Court - Addresses substance abuse and other family challenges for the purpose of family reunification. Family Drug Court, offered through the Juvenile Court, emphasizes the coordination of substance abuse treatment and case management services with child protective services. The court uses rewards and sanctions to provide motivation for successful completion of the program, which will lead to family re-unification. Download the program brochure.